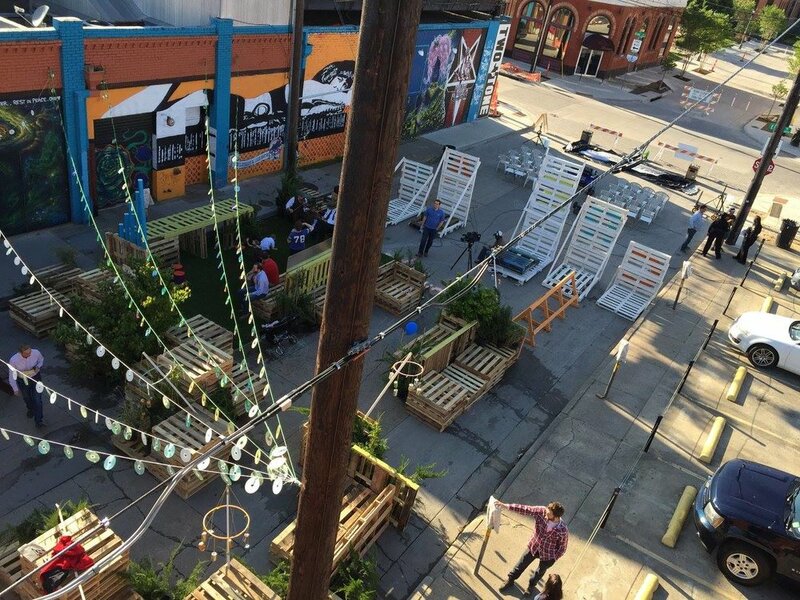 In April 2015, Crowdus Street in Deep Ellum changed dramatically from a small street with 12 parking spots to a pop up plaza made for people to enjoy. Crowdus Park helped address the lack of greenspace and public commons both in Deep Ellum and in Dallas neighborhoods generally. The goal was to not only provide a much needed park in Deep Ellum but also to open up a conversation with the city about how to make projects like this more feasible in the long term. Crowdus Park was a block-long, 96-hour demonstration of a potential public space in Deep Ellum, Dallas’ most urban and creative neighborhood. The project was led by ASH+LIME and included significant collaboration with both TBG and Callison (now CallisonRTKL). The idea for transforming Crowdus into a pedestrian only zone was not our idea, but we did latch onto it immediately. However, years had gone by and the conversation had not advanced into any implementable action. Our objective was to find and create partnerships to make the pop up park a reality. Being urban advocates, we spotted the date for the national conference of the Congress for the New Urbanism (CNU) as an important partner in our project to convey a complete neighborhood in Dallas. The CNU is the nation’s leading organization advocating walkable, sustainable cities. The idea of pop up parks, businesses, and other demonstrations has greatly influenced the up and coming generation of the organization. In an era when municipal budgets are shrinking but civic involvement in city planning is increasing, we felt that Dallas needed to be relevant in this conversation, especially when America’s cutting edge urban planners come to the city. Despite our urban activism and passion for cities, we aren’t designers or architects, however, many urban advocates are. While holding some brainstorming sessions and inviting friends, we attracted the attention of four architectural firms, two of which committed to the Crowdus Park project. Callison and TBG were instrumental in designing the concept of the pop up plaza as well as holding two charrettes for community engagement, vetting ideas from that people want to see the park. All over the country, citizens are taking back their cities, and community engagement is critical to the success of neighborhood interventions. We believe in the concept of Social Capital, or investing people’s will and enthusiasm to make a difference in their community and spur change in a neighborhood. We enlisted the help of both the Deep Ellum Community Association and the Deep Ellum Foundation to help with ideas, volunteer work, and funding. The last important partnership we established was with the City of Dallas, which could have been potentially problematic because the city is not designed to permit pop up parks. The Office of Special Events (OSE) is responsible to managing street closures and public events, but OSE is also housed under the Convention Center. Our partnering with the CNU to supplement their national conference helped in our initial negotiations. The ASH+LIME team was deeply involved in two years of planning for the Congress for the New Urbanism’s 23rd annual conference in Dallas. One of the objectives was to help ensure that this important event would have a lasting impact on the city. Through our founders’ extensive work in Deep Ellum, we identified a lack of high-quality public space as a consistent community concern. Crowdus Street, an underutilized thoroughfare at the core of the neighborhood, was long established as a high-potential street for closure and conversion into a plaza and civic space. ASH+LIME coordinated city officials, three architecture/landscape architecture firms, dozens of artists, and over 100 volunteers to design and program the pop-up park. ASH+LIME guided permitting and production, helped advertise and facilitate community design sessions, coordinated fundraising efforts, and elicited extensive community support. 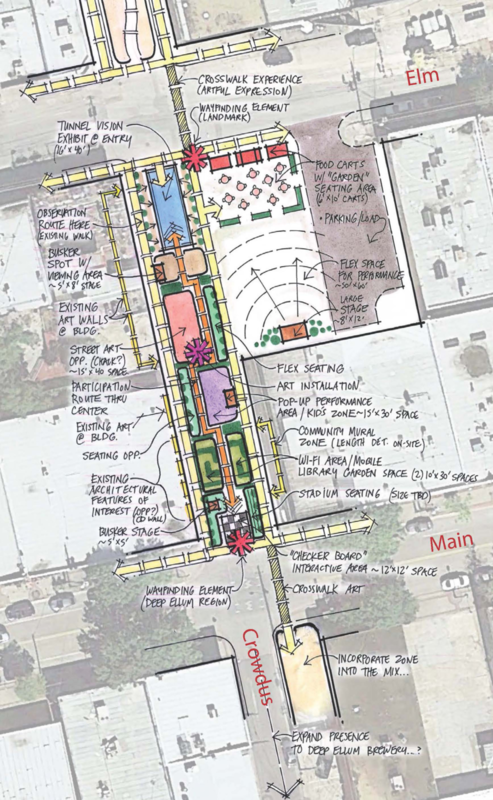 The four-day event supported a broader movement to convert Crowdus to a pedestrian corridor, including a subsequent international design competition and a month-long street closure. The 2017 City of Dallas bond package included investments to make the block into a permanent public space.